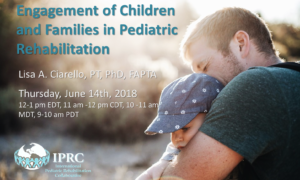 “Engagement of Children and Families in Pediatric Rehabilitation” was presented by Lisa A. Chiarello, PT, PhD, FAPTA, on June 14th, 2018. Lisa A. Chiarello is the Director of the PhD and DHSc programs in the Physical Therapy and Rehabilitation Sciences Department at Drexel University in Philadelphia, Pennsylvania; the Associate Director of the Center for Family Intervention Science; and an international collaborator at CanChild, a network of international researchers organized through McMaster University in Ontario, Canada. Lisa has a strong interest in research and was principal co-investigator on the “Move & PLAY” study funded by the National Institute of Disability and Rehabilitation Research and the Canadian Institutes of Health Research (CIHR) and co-investigator on the “On Track” study funded by Patient-Centered Outcomes Research Institute (PCORI) and CIHR. She is currently co-investigator on the “Engagement in Pediatric Rehabilitation” study funded by CIHR and co-principal investigator on the “Preparing Children for Successful Participation” study funded by CanChild. 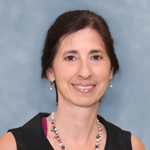 Dr. Chiarello received her Bachelor of Science degree in physical therapy from Ithaca College in Ithaca, New York, and her PhD from Hahnemann University in Philadelphia, Pennsylvania. She currently conducts research in the areas of pediatric community-based service delivery, determinants of outcomes, family-centered care, engagement of families and children in rehabilitation, and participation of children with physical disabilities in family, school, and recreational activities. Dr. Chiarello has been and continues to be a staunch advocate for family-centered care. In addition to her research, she is very active in the APTA Academy of Pediatric Physical Therapy and has held several leadership roles. Identify and implement strategies to foster improved engagement of clients and their families.